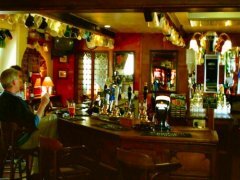 The St Julian Inn is classified by CAMRA as an excellent pub fully deserving a high popularity rating which has won a number of awards over the years including both "Gwent Pub of the Year" and "South & Mid Wales Regional Pub of the Year" - Click Here for more details. 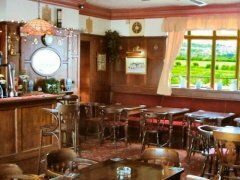 A central bar serves adjoining, but discrete areas, including a lounge panelled with wood from a former ocean liner which leads out onto a riverside balcony giving superb views of the local countryside and nearby Caerleon. To the visitor in search of refreshments, the St Julian offers a good range of traditional beers, wines and spirits which are all kept in prime condition. regular real ales (currently Youngs, Bombadier and John Smith) plus one permanently changing locally brewed guest ale. So if you really want to enjoy our traditional Welsh Hospitality then please drop in at any time we are open - you'll be very welcome!